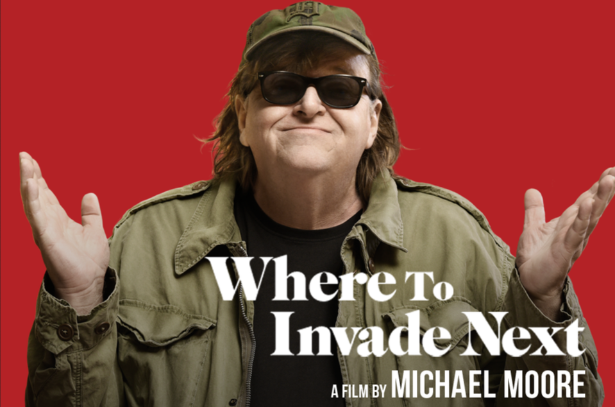 The documentary director's new film 'Where to Invade Next' shows that a learning curve sure beats invasion, when it comes to improving our country. I heard myself laughing out loud more than I do in movies branded as comedies. I also learned new things about global best practices when it comes to equality for women, free higher education and taking excellent care of people who work for a living. Without pretending that other societies don’t have their flaws, Moore tells us that in this film he’s collecting for us not the weeds, but the flowers. Hillary Clinton may try to dismiss Bernie Sanders’s positive reference to a Nordic breakthrough as, “That’s Denmark,” but the cumulative impact of riding along with Moore’s travelogue is un-mistakable: It’s clear how much we the people are suffering for the sake of the U.S. Empire. That’s the metaphor that holds the film together: Since the United States has done so poorly at delivering quality of life recently (or even at winning wars) by relying on militarism, why not send Michael Moore to “invade” other countries to learn about their best practices? How many soldiers do we need to traumatize to learn what other countries do better than we? That, for example, Slovenia’s free higher education works so well that U.S. students are going there to avoid going deeper into debt? Or discover that workers in Italy enjoy paid vacations of five to eight weeks? The Finnish public school system used to perform at a so-so level. Now it is the best in the world, based on international ratings. Moore spends quality time finding out how it works. His interviews include an American teacher and also a student who moved to Finland and compares the two systems. While Moore shows that a learning curve sure beats invasion when we get interested in improving our country, the audience is laughing at the set-ups and gags. The film does turn serious, though, when he pays attention to Germany’s way of confronting the Holocaust. Again, I learned new information about ways Germans learn from the terrible suffering they caused, and join with Moore in thinking we Americans need best practices when confronting the holocaust we brought to native people here, as well as the slavery and its aftermath that whites continue to benefit from. Although I’ve interviewed Icelandic economists about their country’s 2008 financial collapse for my forthcoming book “Viking Economics,” I learned from this movie that one bank came through the crisis just fine – a bank run by women. In the film we learn why. The overall gender revolution in Iceland merits a companion visit to Tunisia, a Muslim country where the women not only participated strongly in the overthrow of the dictatorship that started the Arab Spring, but successfully resisted an Islamist government’s effort to subdue their freedom. With street heat the women won their demand that their equality be enshrined in the Tunisian constitution, an achievement still awaiting the United States. Moore’s interview with the Islamist party’s chief, a patriarch defeated, is by itself worth the price of admission. Meanwhile, his visit to a Norwegian maximum security prison reminded me, as the American movement against mass incarceration does, what a litmus test prison provides for the health of a country. We visit with prisoners in their rooms (not cells) and listen to guards talk about their work. I wish that Americans who reduce their own life expectancy when they take prison guard jobs would see this film. Movements don’t get far without an alternative vision. I hope ours takes a deep look at Norway, where the recidivism rate is a fraction of ours because the focus is on multi-dimensional rehabilitation. The root value underlying their criminal justice system is reinforced in Portugal, where police officers look into Moore’s camera and urge Americans to give up capital punishment because, they say, enforcement must be guided most of all by regard for human dignity. The Portuguese also reinforce Germany’s emphasis on universal health care by noting that they reduced drug abuse dramatically by de-criminalizing it and expanding treatment opportunities. The film gives me hope. Human beings are not a species condemned to ignorance and cruelty. The film includes plenty of reminders of the people power struggles that were waged in those countries to gain their best practices. 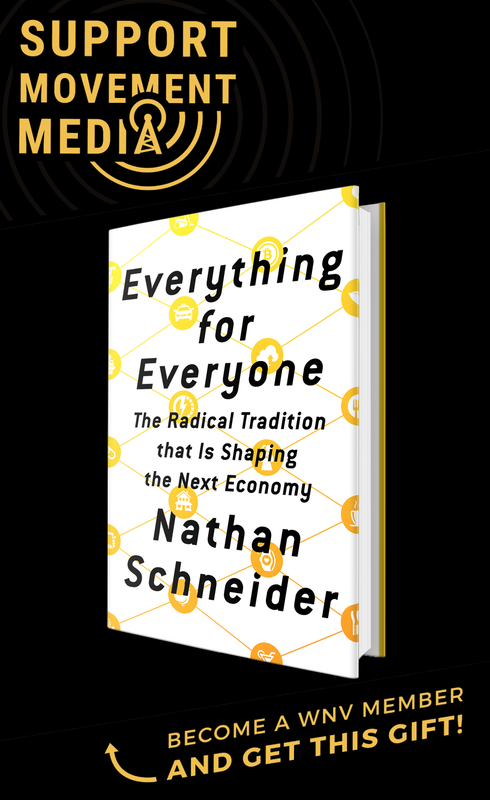 Americans are part of the same species, but have been shielded by the 1 percent-controlled media and schools from knowledge of our potential. Moore’s movie offers us a break-out, and is entertaining at that. This is a great review of a wonderful, heart-felt and eye-opening film. I hope everyone will see it and laugh and be inspired by the society we could create in the US if we really decide we want to. Power to the People! Thanks for the wonderful review of the awesome movie. I went to see it the second weekend after its release, the theater was packed and the audience gave it solid, sustained applause at the movies end. We laughed, we cried, and we learned a lot in between. I highly recommend it!